Welcome to my piece of Paradise! House, 2 Bedrooms + covered veranda, 1.5 Baths, (Sleeps 2-4)Close to beach! Discover the experience of staying at The Wood House - my piece of paradise! Located in Half Moon Bay, West End's best neighborhood. A nice blend of locals,tourists, and expats make staying here a nice part of the experience. Picture Margaritaville and you get an idea of what West End and The Wood House is like. The main drag in West End is dive shops,gift shops,restaurants,bars,food stands,small markets, and water taxis. Your first walk through takes 15 minutes and then longer each time as it's a very social atmosphere so each time you go out it takes a little longer as you're always seeing someone you know and stop to chat. 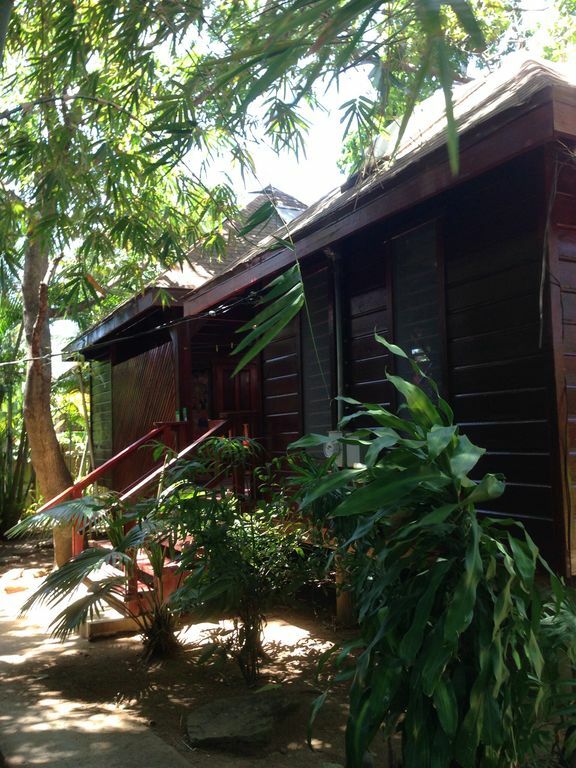 The Wood House is designed to take advantage of the tropical climate Roatan has. Enjoy the heavily planted yard that provides wanted shade during the hot daylight hours. It has to be 15 degrees cooler in the yard once you pass through the gate. Unlike your typical hotel room The Wood House is a great place to relax and hang out. Lay in a hammock with a book or take a nap. The house will occupy four people comfortably but two is just perfect! No car rental is necessary. A two minute walk from the house brings you to West End Beach. Sundowners Beach Bar is right there and a great place to swim, get some drinks and food. Perfect spot to cath the sunset! The Wood House was newly remodled in 2016. Everything inside the house is brand new. It features 2 bedrooms, AC, ceramic tile floors and granite countertops. Safe and secure fenced in yard, washing machine, fully stocked kitchen, outside rinse off shower, cable and wifi, fullyfurnished, covered verandah, hammocks, granite countertops. I've been a painting contractor most of my adult life. In 1988 I took my first trip to Roatan for a scuba diving trip. Years later when looking for a retirement home in the Carribean I decided that Roatan would be the place. I loved the third world feeling. I wanted a more simplistic life and found it. The Wood House in my prejudiced opinion has the very best location in West End. The beach, restaurants, bars, ,gift shops, dive shops are all within a short walk from the house. No car rental is necessary! When staying at The Wood House most of your time is spent outside relaxing under the covered verandah. It's a unique house that offers me all I want and need. To me there is a magical vibe to the house. It's my dream come true! Right at the end of West End Village. Enjoy all that West End has to offer but be far enough away to get a peaceful night's sleep. New Peter Dye designed at Pristine Bay! So many activities to choose from: scuba, snorkle, ride a scooter underwater, parasailing, jet ski rental, zip lines, Island tours, golf, fishing. I have a friend with a nice boat known to be one of the best fishermen on the Island offers a discount to people staying at The Wood House. Loads of good food to enjoyed in the restaurants and street stands. Lots of nightlife with lots of good entertainment. There is always something going on in Roatan or you can simply enjoy a nice evening at home enjoying paradise. One minute walk to Half Moon Bay Beach! The World's Deepest Submarine - a truly A unique experience. Explore depths to 2500 feet below the surface! A one minute walk to Sundowners Beach Bar. All that West End has to offer is but a short walk from the house. Completely fenced in and private.